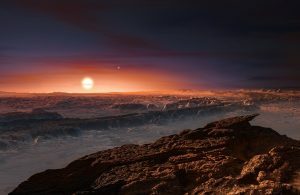 The recent discoveries of planets orbiting around M-dwarfs (stars with less than a tenth of the solar mass), especially Proxima b and TRAPPIST-1, have made quite a splash both in the scientific community and the public. But we are left wondering: How did these planets form? And what should we expect them to be like? The prospect of having planets in the habitable zones of these stars is indeed exciting, but it may take some time for us to be able to reach more definitive conclusions about them. In the meantime, however, simulations may shine some light into this puzzle, as we will see in today’s astrobite. There are various reasons why M-dwarf stars are one of the most exciting targets for exoplanet search in the recent years. Firstly, these are very low-mass stars, which means the gravitational interaction with their planets makes them swing wildly, thus strengthening the detection signal; secondly, they are cool stars, which makes their habitable zones sit relatively closer when compared to Sun-like stars; and, finally, the previous facts make it easier to detect planets in habitable zones, turning them into strong candidates for Earth-like planets. The two famous cases I cited above are good examples of candidates, but we don’t know much yet about them besides their orbital motion, because that is pretty much what our current instrumentation allows. That doesn’t mean, however, that our hands are completely tied at the moment, as we will see below. The authors of today’s article argue that we should expect the chemical composition of planets around low-mass stars to be substantially different from what we see in solar-like systems, because the formation and evolution pathways are also different. They sought to prove their assertion by running theoretical simulations of populations of strictly close-in planets around stars with 0.1 solar masses, evolving the planets, and measuring their bulk properties: mass, radius, orbital period and water content. Figure 1: The distribution of planetary masses (y-axis) and water mass fraction (color bar; the closer to blue, the more water-rich a planet is) as a function of semi-major axes (x-axis) for the simulated planets. The water content of a planet around an M-dwarf doesn’t seem to correlate with distance from the host star. According to the results obtained by Alibert & Benz in today’s paper, the amount of water in a planet depends mainly on its migration history, and where it accreted material: if the planet accreted planetesimals beyond the ice line — where conditions are ideal for water to condensate — it tends to have more water. Most surprisingly, for M-dwarf stars, the water content on orbiting planets do not correlate strongly with the levels of irradiation, that is, the distance from the star. As can be seen on Figure 1, the bluer symbols (more water-rich worlds) are distributed pretty evenly along the x-axis, which corresponds to the semi-major axis of the planet’s orbit, and is a measurement of the distance from the star. This is expected because the main source of heat in the inner regions of the protoplanetary disk is the friction between particles instead of radiation (remember we are working with close-in planets only). 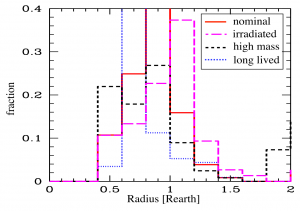 Figure 2: The histogram of planetary radii (x-axis) obtained from the simulations. 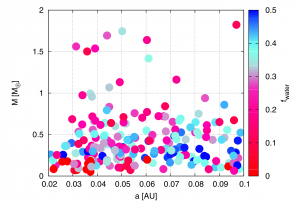 The colored bars represent different populations of protoplanetary disks. All of them peaked at 1 Earth radius, which means most planets around M-dwarfs should be expected to be as small as the Earth. It is striking, however, that the water mass fraction in most of the simulated planets are above 10%, which means they could be ocean worlds — planets completely covered by a large layer of water. For the sake of comparison, water makes up less than 0.1% of Earth’s mass! The authors explain that the reason for this large water abundance is because of the slower evolution of low-mass protoplanetary disks, which allows the forming planets to accrete more and more water. On the other hand, the most massive disks of the simulation tended to produce drier planets, due to their faster evolution, but still significantly more water-rich then the Earth. Another interesting feature of the simulation was that the distribution of radii of the planets peaked at 1 Earth radius (see Figure 2), a prediction that is supported by the non-detection of transiting planets around M-dwarfs on K2 data, in which planets as small as 1 Earth radius are below the detection limit of the instrument). At first, the prospects of finding water-rich planets seem exciting for the search of life beyond Earth, but this overabundance may actually be a hindrance for life as we know it to flourish. For one, deep ocean worlds may prevent the existence of a carbonate-silicate cycle, which regulates planetary surface temperatures in the long run. The second reason is that these oceans promote an unstable CO2 cycle that may destabilize the global climate of the planet (see this recent astrobite by Tim for a discussion on how oceans influence habitability). While these predictions sound bleak, only observational data will give us more definitive answers, and the new generation of big telescopes will play a crucial role in the near future.